« Hot magma is melting Greenland ice – can windfarms save it? About a third of the sunlight that hits Earth gets reflected back out to space mainly by clouds, ice or bare earth. A small change in this can make a big difference to the global energy balance. And the energy balance is kinda “everything” in the climate debate. So this new paper by Palle et al really ought to attract quite a bit of interest. But for lots of reasons real data was never going to provide much joy for most climate scientists. Image of the moon taken by Bob King of Sky and Telescope. The thing is, climate models predict that CO2 will cause warming, which will in turn cause ice to melt and the albedo to get smaller, which will cause more warming… it’s a positive feedback. So if albedo was shrinking during the last 2 decades, the Crisis Team could say the models were right about albedo, but then, golly, they were even more wrong about that warming that didn’t happen. On the other hand, if albedo was growing, they could add it to the list of excuses for The Pause and write headlines like: Global clouds increase — hiding the effect of CO2! But then skeptics could point out that if more CO2 causes more reflective clouds, the albedo may act as negative feedback — disaster averted. But back to that data. One of the ways to measure albedo, can you believe, is to track Earthshine — the light that the Earth shines on the dark side of the moon. Obviously Earthshine is the lucky lotto-winning-light that reflects off Earth and hits the Moon, and then reflects back again to Earth again. A new study by Palle puts together 16 years of data on this and finds there are big changes from year to year but overall there is no trend, which rather fits with The Pause. Somehow, strangely, even though Life on Earth depends on calculating our Energy Balance, the golden river of climate gravy is not running through the land of Earthshine research. The researchers shifted from a meagre one telescope up to two in 2006. There’s a big gap in the global data in Figure 2 when that happened (see below). But even two telescopes are barely adequate. Palle et al estimate that with eight automatic robotic stations they could achieve 2 – 3 times the precision they have now. But while we can find funds to subsidize 225,000 wind towers, we can’t afford to do the proper basic research that might tell us whether we needed those 225,000 wind towers. Crony-renewables anyone? If there is a crisis in our global energy balance, a lot of people don’t seem to be taking it seriously. The Earth’s albedo is a fundamental climate parameter for understanding the radiation budget of the atmosphere. It has been traditionally measured from space platforms, but also from the ground for sixteen years from Big Bear Solar Observatory by observing the Moon. The photometric ratio of the dark (earthshine) to the bright (moonshine) sides of the Moon is used to determine nightly anomalies in the terrestrial albedo, with the aim is of quantifying sustained monthly, annual and/or decadal changes. We find two modest decadal scale cycles in the albedo, but with no significant net change over the sixteen years of accumulated data. Within the evolution of the two cycles, we find periods of sustained annual increases, followed by comparable sustained decreases in albedo. The evolution of the earthshine albedo is in remarkable agreement with that from the CERES instruments, although each method measures different slices of the Earth’s Bond albedo. Palle, E., et al. (2016), Earth’s albedo variations 1998-2014 as measured from ground-based earthshine observations, Geophys. Res. Lett., 43, doi:10.1002/2016GL068025. Taking shots of the Moon? Bob King, of Sky and Telescope explains the finer details: To take your own photo like this, you need to get up just before dawn on April 6th (probably not possible now) to see the last tiny sliver of the moon. April 7th is a new moon. April 8th we’ll see a sliver of the waxing moon just after the sun sets. The post there counts the hours after the new moon occurs… Moongiant tracks the phases. During the 1980s and 1990s, ISCCP cloud albedo fell, equivalent to a reduction of cloud area by ~3%. The subsequent steady albedo might be considered to be from reduction of cloud area. However, the real explanation is probably that it was from the extra aerosols produced by Asian industrialisation reducing cloud albedo, the real AGW. The present steady state appears to be from Brownian Motion agglomerating those aerosols, hence the ‘Asian Brown Cloud’, first detected in 1999. The change in cloud cover during the 90s was worldwide, consistent with a changes in zonal/meridional forcing. asian smog is clearly not the cause. Crazy idea… why not measure earth’s albedo directly through satellite measurements rather than with a proxy which may, or may not, be an accurate one? Am I missing something here? The Moon is a satellite. But, as you note, there’s a lot of jiggery pokery to get useful results as observing the Moon through the atmosphere intrinsically introduces distortions. If “global warming” had been a problem in the 1960′s (it was warmer at the start of the decade, but not a problem), then the Apollo missions may have deployed an albedo observatory on the Moon’s surface with direct telemetry back to Earth. But then again, if it had been a “problem”, then we’d never have landed people on the Moon and returned them safely to Earth. Given that is take of the order of 5% change in albedo between climate optima and ice ages, even artificial satellites struggle to measure the difference over the necessary period. It takes much more than one “measurement” and their addition accumulates errors. Yes; there ARE satellites which do measure radiation from the Earth. They were used by Lindzen, et al. to measure the nett “negative feedback” during warming. Lol Bulldust! ISCCP mentioned above stands for International Satellite Cloud Climatology Project! Data runs from 1982-2009, Climate4you.com has all the stuff under climate and clouds page. Earth’s albedo can be measured directly from space using the Deep Space Climate Observatory. The observatory (aka GoreSat) is a satellite in a Lissajous orbit at the Sun-Earth L1 Lagrangian point. At this position it has a continuous view of the sunlit side of the Earth, apart from the lunar transits at the time of the New Moon when the fully lit Far side of the Moon crosses in front of the Earth’s disc. Not smog: aerosols which are carried around the World. In time I will give the quantitative analysis of why current aerosol optical physics predicts the wrong sign for the AIE, also how the climate models use this incorrect physics to give imaginary CO2-AGW and positive feedback. This scam started in 1969 when Hansen made a fundamental error in his corrections for Mie Scattering. Two year earlier, van de Hurst made the same mistake. Typically, “dark side of the moon” refers to the “far side” or “back side” of the moon — which the earth never sees and upon which the earth can never shine. Yes, I was confused about this. The unseen side of the moon is typically and historically referred to as the dark side, the unseen far side, the fixed side and unchanging side of the moon, unseen and unknown and mysterious until the mid 20th century, a side which is fixed and definite. This dark side reference is to the part of the moon currently in shadow and as it moves continually and varies in size is not a side at all, simply the part of the moon in its own shadow as visible from earth. This varies in size from nothing at a full moon to a full circle in the middle of the day. Absolutely – it had me wondering at first, too. That shows a drop in albedo during the warming spell and a slight increase in albedo at the time warming ground to a halt. Thereafter, albedo has on average remained stable, hence the pause. Note that albedo tends to increase during solar quietness (the very low solar minimum around 2010 is a clear example. So, I expect to see albedo increase further during the remainder of cycle 24 and into cycle 25 with a global cooling effect in due course. If you an I, and a lot of other unhatted men of a certain age were to stand in sunlight, Earth’s albedo would rise. I’ve lost even more since that photo was taken. No joy for Burke and Wills up there Steve. Doing your bit against global warming. Re-enter the cosmic ray hypothesesis? Or to give credit the “Svensmark hypothesis”. Or there again perhaps several effects have their origin in the one cause. The paper you quote gives one more piece in the puzzle. A few weeks ago, on Weekend Unthreaded, I discussed the variation in Solar Intensity resulting from the slightly elliptical Earth’ orbit. The variation between perihelion and aphelion amounts to 90W/m2 at the upper atmosphere level (by the inverse square law). The puzzling think is that the average global temperature estimates do not show any annual variation. Figure 1 of your first reference however shows a strong periodical annual variation in global cloud cover, with the peak cloud cover occurring in January (perihelion). That seems to me to be good evidence that clouds are a negative feedback mechanism on global temperature, predominately cooling. We find two modest decadal scale cycles in the albedo, but with no significant net change over the sixteen years of accumulated data. …a detector for EDA perhaps..
Our planet being an orb, light then is bent on the surface and as it goes towards the moon, defused wider. Like using lenses that you can concentrate or defuse the light depending on the curvature of the lens. Doesn’t the atmosphere do that? The nice thing about empirical observations is that one can often verify them from a range of entirely different perspectives. Business as usual, as it has been over the last 8000 years. But then, it never was about the science was it? Palle, E., et al. (2016), Earth’s albedo variations 1998-2014 as measured from ground-based earthshine observations, Geophys. Res. Lett., 43. McKitrick, R.R. (2014) HAC-Robust Measurement of the Duration of a Trendless Subsample in a Global Climate Time Series. Open Journal of Statistics, 4, 527-535. The moon’s rotation is locked in phase with its orbit, so the same face is always turned to us. The face permanently turned away from us has traditionally been called the moon’s Dark Side for eons, although it’s more accurately the the Far Side. It was called the Dark Side because we never saw it and its topography was unknown until the Space Age orbited cameras around to it. It’s not to be confused with Pink Floyd’s 1973 album of that name. Does the moons far side get any light via albedo from other planets?, and if so how is this measured or observed? To be honest I’ve never thought of the idea it does. Yes but it gets a lot more starlight in comparison. You can measure other planets albedo by directly looking at them. It would we wouldn’t be able to measure it without posting a permanent satellite round there or landing instrumentation on the Far Side. We can’t see it. Most probably it would be so small to be almost unmeasurable. Venus is the only other `close’ planet, which could `illuminate’ it but considering how brightly earthshine lights it, Venuslight would be insignificant. All `sides’ or `faces’ of the moon get about the same starlight but not at the same time. Between the morning and evening new moons, the dark face receives starlight and earthshine. By full moon, the Far Side receives only starlight (and maybe a tiny amount of Mars shine). Maybe there would also be some light from Venus and Jupiter. They can be very bright depending on position re. the Sun and us. Years ago we walked up to Steavenson’s Falls at Marysville and forgot to take a torch with us. We had to walk back down to Marysville by starlight only. It was enough, just, to see where we were going and thank goodness it was a very clear night! Some commentary on this at “notrickszone”. This method appears (to non expert me) to be a simple, cost effective, verifiable, stable reference measurement of importance. I’m surprised it has only been done for such a short time when potentially it could be very informative. It seems sometimes we do things the hard way. Its well understood that filthy dark clouds close to the surface is reckoned to be negative feedback, while the cool high cirrus can be negative or positive. Why is it so? These characters seem to be of the opinion that higher clouds are a positive feedback. A group of scientists recently put out a new study confirming the 15-year “hiatus” in global warming. What went largely unnoticed was a major admission made by the paper’s authors: the climate models were wrong. Overall, the paper is an admission by prominent members of the ‘mainstream’ scientific community that the earth’s surface temperature over the past two decades or so has not evolved in a way that was well-anticipated by either the scientific community and/or the climate models they rely on. How many scientists does it take to admit the obvious? How many research grants and PhDs to prove that the billions spent trying to blame steadily rising CO2 for changing the planet’s temperature are completely wated and the unproven theory is wrong? The real question is why something like this hypothesis has to be disproven at all. It would be far better for someone to have actually proven CO2 caused warming. The best and only argument I have read for CO2 driven Global Warming is ‘everyone knows’ CO2 is a ‘greenhouse gas’. That’s it for the science folks. In Australia nothing unusual has happened in that regard, same old drought and flooding rains depending on ENSO, but looking ahead we should expect more La Nina. Richard Lindzen proposed his IRIS hypothesis where high level cloud cover acted as a regulator of the Earth’s temperature. Following is a quote from the abstract of his paper; Does the Earth Have an Adaptive Infrared Iris? and it has been found that the area of cirrus cloud coverage normalized by a measure of the area of cumulus coverage decreases about 22% per degree Celsius increase in the surface temperature of the cloudy region. A number of possible interpretations of this result are examined and a plausible one is found to be that cirrus detrainment from cumulus convection diminishes with increasing temperature. The implications of such an effect for climate are examined using a simple two-dimensional radiative convective model. Somehow I seemed to have cut off a fair section of that abstract quote from Richard Lindzens paper. Ah well you will have to read it yourselves as darned if I know what is going on! I take it that there are no studies/data that precede that used study to see if the reflected light measured on the moon matched expectations when the earth’s temperature trend was increasing prior to the pause? happy to rephrase to, “…was supposedly increasing…” or similar. What would the “studies” match then? Nothing to nothing? Something to nothing or nothing to something? but overall there is no trend, which rather fits with The Pause. This is something you know all about. Your life’s work, so to speak. Just the 16 years by the sound of it. Something caused it, what is your opinion? I suspect an extended period of zero cloud, allowing a lot of UV into the upper water surface. The wet season failed because of the Madden Julian Oscillation and as you said, no cloud means higher SST. I’ll put this in for those who maybe vaguely interested. darn, and I hadn’t even looked at the data for that region. The bleaching is in the very northern section only. In the last 4 years, the coral coverage in the southern section has nearly DOUBLED. ! They never tell the full story in the AGW sites, do they ! There is a question about the technique itself. The light from the shadow side is probably impossible to measure during the day because of background scattered light, so it is a night time only exercise except for satellites. A half moon can only be seen for half the night and a quarter moon for quarter. So what are you measuring? The albedo of the earth or the amount of light which makes it around the planet, which would depend on many things other than the albedo? This is not light which has bounced off the earth or necessarily even struck the earth’s surface. For example Lord Monckton’s paper was about the lack of clouds over the oceans in the 1980s as a possible cause of warming through the decreased reflection/albedo. However the real heating from the sun happens during the day, when the moon is not visible and certainly not the shadow part even if it is in the sky. On the other hand the technique might be useful or even available from satellites when the sun is fully on the earth, but why aim at the moon? We have those numbers and they show no change in radiation from the planet. This is an interesting aside which reveals that what they are measuring changes around a fixed mean, but what is it really? It may not be the earth’s albedo. I think that’s why they said more observations from more locations would increase accuracy. I don’t think the technique is as fragile as you suggest because when the moon is just a “slither” it is between the sun and earth but off to a side, I.e.a viewer looking at earth from the unlit side of the moon facing earth would see the better part of an almost fully lit earth. Consistentcy of measurment is important. Using the ratio of bright sunlit moon slither : earthlit portion shaded from the sun should make scattering less of an issue. Yes but the sliver you mention means the sun, moon and earth are nearly in line, the sun nearly behind the moon. This can only happen at the two ends of the night, close to sunlight. The moon in this condition is not up for long against the very black night sky at midnight but either just falling at dusk or just rising before sunset. Neither are good times to measure anything with accuracy. The major shadow is clearest when the moon is up during the day. A moon overhead at midnight is a full moon. Please correct me if I am wrong. As I see it, you are right: the window of best measurement is small. That doesn’t mean it’s not useful. My question is what is it measuring? Human light is not enough to light up the moon. So while we are in night, the light comes from that scattered around the edges of the planet, which is a sort of albedo measurement at extreme angles through a very thick atmosphere and glancing angles from the surface, if it happens to hit. The proposition that you are indirectly measuring the albedo of the planet in full sun striking directly is not obvious. You would be measuring a pretty large sample disc of average light intensity eminating from earth. You can compare it to the known intensity from the sun (measure the slither). The unlit side of the moon is facing the lit side of the earth but you measure it in the dark (just beyond twilight) from earth. Oops, slither should be sliver. You are not measuring the albedo of the moon, but the reflection of the sun from the earth. So it should be a reflection from the earth, not sun which goes around the earth in a corona or bent through the atmosphere, not even touching the earth. I suspect that is what slightly lights up the shadow on the moon during the night. You are not looking at the sliver, you are looking for the other bit. The brighter, the more light from earth and they argue, the higher the reflection from the earth except that it is not reflection. We are all familiar with moonlight and know that this light is a reflection of sunlight from the surface of the Moon. We also know that moonlight is strongest and brightest at the time of the Full Moon, when on a clear night; it can produce a moon shadow on the ground from any freestanding object. Imagine that you are an astronaut standing on the nearside of the Moon at the time of the New Moon, the sun is below the horizon and it is night time over the whole hemisphere of the Moon’s nearside. Above you in the black lunar sky is the completely sunlit orb of the Full Earth, the lunar surface around you is brightly illuminated by earthlight, the reflected light shining down onto the night time Moon from the sunlit Earth. It is this earthlight illuminating the New Moon that we can see and measure from Earth at this time. Full Moon, when the nearside lunar hemisphere is fully sunlit, typically occurs fourteen days after New Moon. For an astronaut standing on the nearside at this time; the sun is above the horizon and it is daytime over the complete hemisphere of the Moon’s nearside. In the sky above the Moon is the completely dark orb of the night time New Earth with a twilight terminator rim of transmitted sunlight passing through the earth’s atmosphere. The surrounding lunar surface is brightly illuminated by sunlight, but there is now no reflected earthlight reaching Moon, as the night time darkside of the New Earth does not reflect any sunlight. 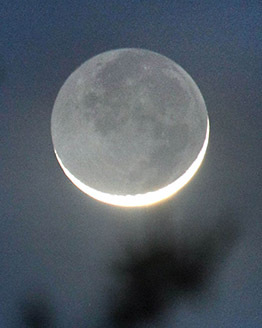 Consequently we can only observe earthshine and so deduce the Earth’s albedo at the time of the new moon. The record heat waves continue, according to evening television news channels, and no doubt their BOM climate change media release suppliers who were discredited by a BOM internal audit last year, errors and omissions in media releases that did not match BOM historical records. But they say the earlier period of heat now being exceeded was 1986. So it has been cooling now for thirty years? Over the past few days there have been record cold days set in NE USA. Picked this up from AER, it feels like climate change. ‘The overall negative trend both in the AO and the North Atlantic Oscillation (NAO) will help to maintain below normal temperatures in eastern North America while temperatures will likely cool relative to normal across northern Eurasia, including Western Europe and East Asia. Can anyone from the ENSO Fantasy Club point out the ‘two modest decadal scale cycles in the albedo’ in the above graph? What the graph does show, is the obvious ‘albedo’ effects caused by the Icelandic volcanic eruptions of 2010,(that closed Heath Row) – and the South American eruptions of 2013, that caused the closure of Tullamarine and Auckland airports. The depletion of ‘water vapour/cloud albedo, brought about by the influence of the ‘X Factor’, is varied by the moon’s ‘nodding’ on its axis every 18.61 years, (Lunar Metonic Cycle,) thus ‘interfering’ with the passage of the X Factor ‘flux’, and its interaction with the Earth’s atmosphere. So, it seems there are two opposing phenomena at work simultaneously. The increase in volcanic activity and wind-blown dust producing ‘albedo’ (therefore Cooling,) and the rise in temperature brought about by the X Factor- induced depletion of upper level cloud/water vapour albedo. The proximity of the current Lunar Metonic Cycle,(2016) – may render 2018 ‘Dry’, when it should be ‘Wet’/Normal. Note; Australia is one of the last countries affected in the East to West longitudinal orbit of these Solar-induced Cycles. I’m sorry to hear about Mr Row. So you think these measurements have meaning and you immediately apply the meaning as evidence for your pet idea? Yes Gee Aye, I think the albedo measurements have meaning – and the consequences of the noted volcanic events actually happened. I apologise for my spelling error. 16 years is not very long to come to conclusions about trends in a data signal that noisy. If they release the study free of a paywall, I will have a look at their discussion. sets of albedo anomalies are in good agreement over the 14 years they have in common. to resolve these issues, as well as pinning down the role of large-scale phenomena. would be able to obtain global coverage with about 2-3 times the precision we have now. Indeed. It sounds like a work in progress to me. The results from the DSCO aka “Goresat” will be interesting. The spacecraft is far enough out to sample most of the earth’s visible in single snapshots. Give it several more years. Apparently there has been no significant decrease in albedo for 16 years (January1999- December 2014) although there are decadal cycles, which fits with an 11 year solar cycle. This appeal to the earth’s albedo (reflectivity) as measured by light reflected from the earth, reflected from the moon, back to the earth as a proxy measure of earth’s temperature apparently saves the “pause“ from the embarrassing fact that actual temperature measurements now show statistically significant warming. 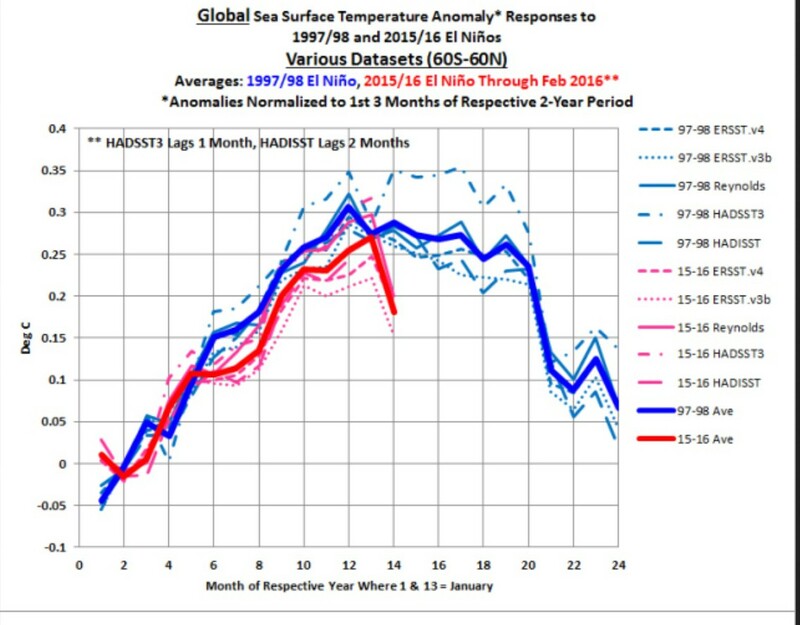 For the period of January 1999 to December 2014 at least four temperature data sets show statistically significant warming NOAA, Gistemp Berkeley, Hadcrut4 krig v2. The basis of the claim that reflected lunar albedo is a reliable proxy measurement for temperature, more reliable than actual temperature measurements, is not made by the scientists themselves. And note that this is a measure of visible light, not infra red radiation trapped by greenhouse gases such as CO2. The albedo loss from the earth is primarily associated with the loss of the arctic ice cap, which as this data shows clearly has decreased over the last several decades. The decrease in area from 1999 to 2014 is about 1 million sq km, or 0.02% of the earth’s surface. And note that the seasonal variation in arctic ice cover in 2012 was almost 3 million sq km, the largest such change in area, and therefore one would conclude, the albedo. Yet the albedo measurements for 2012 in the chart displayed in the introduction show one of the smaller seasonal variations. So the fact that there should be no significant reduction on the twice bounced sunlight as measured by the moon over a sixteen year period would surprise no scientist. Where are the ‘decadal cycles’ and how do they ‘fit in’ with an eleven year solar cycle?